Prepare to be dazzled as you venture into this vibrant and colourful country full of grand imperial cities, spectacular landscapes, ancient ruins, bustling souks, beautiful handicrafts and a mouth-watering cuisine. Prepare to be dazzled as you venture into this vibrant and colourful country full of grand imperial cities, spectacular landscapes, ancient ruins, bustling souks, beautiful handicrafts and a mouth-watering cuisine. The fascinating history and rich culture will captivate as you uncover all that is exotic in this magical place. 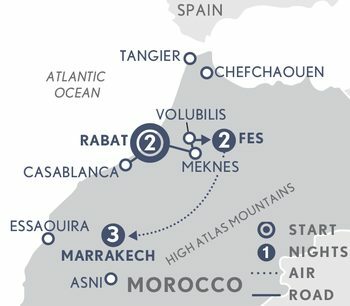 Discover six UNESCO World Heritage Sites on this introduction to irresistible Morocco. Receive a warm Moroccan welcome in Casablanca where you are met and driven up the Atlantic coast to the country’s charming capital, Rabat. Often overlooked, Rabat, a UNESCO World Heritage Site, has a modern diverse culinary scene, ancient and modern architecture and a thriving art culture. Spend a lazy afternoon in your luxury accommodation, or step outside and uncover more of this city. Head out and observe the many cultural influences and superbly preserved relics of Rabat’s Moorish past. Start off at the 12th century Hassan Tower, an excellent example of the Moorish style with its incomplete minaret of the great mosque built by Yacoub al-Mansour. Next door is the mausoleum dedicated to Mohamed V, the founder of modern Morocco and the grandfather of the current king. You also pay a visit to the Oudaya Kasbah which is built on a bluff overlooking the ocean. Its gate is one of the most beautiful surviving in the Moorish world and within its walls you'll explore a delightful craft museum housed in a former palace, as well as an Andalusian garden, complete with tinkling fountain and sweet-smelling orange trees. Beyond the city walls are the most hauntingly beautiful ruins in Morocco, the ancient Roman remains of Sala Colonia. Set amidst crumbling walls in a garden of tropical plants see the necropolis of the great Merenid leader, El Hassan and the tomb of the mighty “Black Sultan”. Finally, visit the Mohamed VI museum of Modern & Contemporary art, a great introduction to Moroccan history and contemporary Moroccan artists. Your journey continues today with a drive to Fes via splendid Meknes, a UNESCO World Heritage Site and one of the Imperial Cities of Morocco. The impressive monuments here are splendid and were built in the 17th century by the powerful sultan Moulay Ismail, to rival the court of his contemporary Louis XIV of France. Marvel at the monumental Bab Mansour gateway - considered one of the finest of the great gates of Morocco, the granaries and the royal stables, which were built to accommodate some 12,000 horses. After lunch travel onwards to Volubilis, also a UNESCO World Heritage Site, home to the largest and most well-preserved Roman ruins in Morocco. With its triumphal arches, basilicas and capitols, the Volubilis skyline is peppered with examples of great Roman architecture. However, the greatest treasures of Volubilis are the superb mosaic floors, which have been excellently preserved and left in situ. Arrive in Fes this afternoon. Step back in time to the Middle Ages today when you visit Fes El Bali, the largest living medieval medina-city and the cultural heart of Morocco. Stroll through some of the 9,000 narrow lanes, alleys and souks that make-up the labyrinth of the city’s old quarter, originally founded in the 8th century AD by Moulay Idriss I. The medieval medina is a UNESCO World Heritage Site. The imperial capital was a renowned centre of medieval learning and at its heart lies the Karaouine, one of the oldest, still-functioning universities in the world. In the neighbouring building is the Attarine Medersa (Koranic college), a jewel of Hispano-Moorish architecture, built in the 14th century. You will also visit Nejjarine Square, with its beautiful fountain, made up of mosaics and elaborate tile-work. The nearby Fondouq (Caravanserai) is now converted into a museum of carpentry artefacts. A visit to the tanneries will reveal how the country’s highly esteemed leather is dyed using all natural ingredients before continuing on to Dar Batha, the former royal palace, and the Museum of Moroccan Arts, which houses historical and artistic collections of wood carvings, embroidery, tribal carpets and ceramics. Discover Fes El Jedid (New Fes), built by the Merinid Dynasty in the 13th century. Here you will see the Royal Palace, mosques, medersas, souks and the city wall. Most notably, Fes El Jedid is home to the Mellah, the old Jewish quarter, where the wrought iron-decorated windows and splendid carved wood balconies of the old mansions are particularly outstanding. After a morning at leisure transfer to the airport for the flight to the thrilling city of Marrakech, also known as the ‘Pearl of the South’, ‘Jewel of the South’ and ‘The Red City’. Private transfer to your luxury accommodation with the rest of the day at leisure. Step outside and explore at your own speed. Get a taste of exotic Marrakech today when you delve into the mysteries of the medina, the old walled section of the town, where most the city’s architectural attractions lie. Wander the labyrinthine souks, looking for treasures and bartering hard. Souk Smarine is a maze of colourful alleys dominated by textiles, clothing and handicrafts – a shopper’s paradise. Admire some of the city’s beautiful gardens and the Koutoubia mosque, an emblem of Marrakech. Koutoubia’s minaret went on to inspire the architects of the Giralda of Seville and the Hassan Tower of Rabat. The mosque cannot be visited but its beauty can be admired from the gardens and the square. This square tower in finely-worked dressed stone is 77-metres high including its lantern. Built in the 12th century, the minaret is considered the most perfect Islamic religious structure in North Africa and it dominates the local skyline. Towards day’s end you wind up in Djemaa El Fna, the city’s main square and beating heart of Marrakech. Home to a multitude of street-artists, stalls of dried fruit and freshly-pressed orange juice, snake charmers, story-tellers, acrobats and musicians, cafés, restaurants and a rich aroma of barbecued meats and spicy tagines. Get a front row seat and sip a mint tea as you watch the spectacle from above. The day is yours to explore your way. Join a chef led experience through the souks followed by a fascinating Moroccan cooking class or journey to the High Atlas Mountains soaking up the views and meeting some of the Berber tribes that call the region home. Alternatively step out and discover Marrakech on your own perhaps bartering with the shopkeepers of the souks and markets for that final trinket or simply sit back and relax in the luxury of your beautiful hotel before your final evening in Marrakech. Private transfer to the airport for your departure flights.